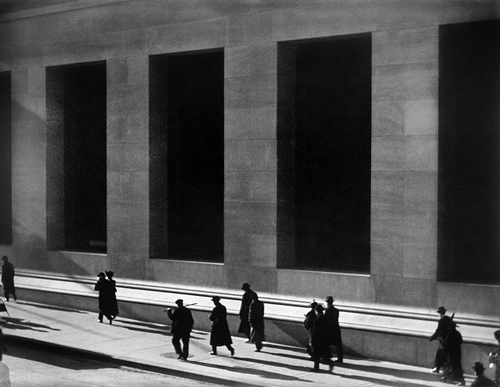 On November 10, 2010, I gave a noonday talk at the IU Art Museum about a single Paul Strand photograph as part of their ongoing Invited Speakers series. The IU Art Museum has extensive holdings on photography. As I was going through their binders listing the photographs in their collection, I was excited to see that they had photographs from the early period of Paul Strand’s career, and several photographs from around 1916. Paul Strand (1890-1976) was a figure I first came to study and admire during the writing of my documentary-influenced dissertation, New Media Activism from Video to the Internet. His pioneering documentary work exerted a great influence on numerous politically engaged media producers in the 20th century. Moreover, much of my current scholarship engages and explores media experiments born in moments of early technological adoption. This particular photograph provided me an opportunity to probe into the development of art photography as it entered its modernist phase in the 20th century, and help me further understand a formative moment in the long and stellar career of Paul Strand. For the purposes of my talk, I ended up selecting “House and Billboard” (Strand, 1916) for both scholarly and personal reasons. What follows is a summary of what I covered in that 30 minute talk. As the photograph itself seems to invite, I had to approach from several different directions, each time appreciating another aspect of the photo. As a new media scholar, my investigations into a single 1916 photograph actually brought me right back to the present where similar photographic techniques have become ubiquitous in the 21st Century. We can still see Strand’s impact on representations of our digital worlds. For me, this photograph captures intersecting moments that are “coming of age” at about the same time: Strand as a photographer; New York as the 20th century city; modernism as a major cultural logic; photography as an important art form. At the outset, I would be remiss if I didn’t address a very personal reason for selecting this photograph: three generations of my family have been in the billposting business. I was drawn to the image of the billboard in this photo. As Roland Barthes would say, that advertising sign was my “punctum,” the personal detail that created my special relationship with this image. I became interested in images at a very early age, and I know a big part of my fascination was watching my father put together images high on a billboard platform off the busy highways of Chicago. I think billboards tend to get very short shrift in visual studies because they are seen as rather banal roadside monstrosities. But they never felt that way to me since I could literally see how they were carefully stitched together to render messages to drivers who might literally glance at them for a brief moment on their way to somewhere else. I also think that their ubiquity is the essence of their invisibility in visual culture studies. I rather enjoy that one of Paul Strand’s modernist masterpieces includes, quite deliberately and quite radically, a billboard. So what of that billboard? In the bottom corner of the image, it anchors the entire composition, but it is only partially seen. From our current vantage point, we can’t even really make out what the billboard is actually advertising. Luckily, Strand himself, in one of his later interviews, remembered this particular billboard and the full names we only partially see: Charles Frohman and Julia Sanderman. With that bit of data, we can deduce that we are looking at an advertisement for a play that just opened in New York that year (1916). It was the play, Sybil, and it ran for 169 performances on Broadway [As a brief side note, Sybil is also the name of my wife, and it was a bit startling to learn that her name appeared on the billboard that so caught my attention—talk about your structuring absences as punctums] Anyhow, to return to the billboard: Sybil the play was adapted from Victor Jacobi’s operetta Szibill. It was produced by Charles Frohman and starred Julia Sanderman. The show itself was set in Russia and tells the story of a prima donna who assumes the identity of a Grand Duchess, and the Grand Duchess assumes her identity. It is a play of masquerades and role reversals. Even if Strand didn’t know the full content of the play, he would surely have been familiar with the classical concept of the sibyl—in other words, a sibyl is a prophetess. I think it is very clever of Strand in one of his most prophetic images—an image that literally inaugurates a modernist vision in photography—that he carefully elides a direct mention to prophesy, but leaves enough clues for the reader to discern that this photograph has a powerful connection to prophesy. 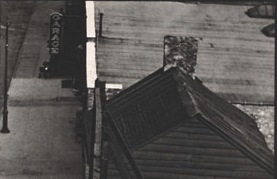 The billboard also serves as a false façade in the photograph, something Strand wants us to look above and beyond, but also it is an early indication that the urban landscape would soon be filled with advertising. I think this begins to show how modernity and advertising co-existed from the beginning, and the rapid changes of modern communication would be built upon a backbone of advertising. Where is Strand standing when he is taking this picture? It’s a good question, because it would appear that there isn’t a building tall enough in that neighborhood to give the 26 year photographer this vantage point. And indeed, this photograph was a literal impossibility a dozen years earlier because the structure upon which Strand is standing did not exist. This is New York as the “City of Ambition” because Strand is not standing on a rooftop, he is actually standing on the 125th St. Viaduct–the train platform built in 1904, still in use today for the 1 Train in New York City. 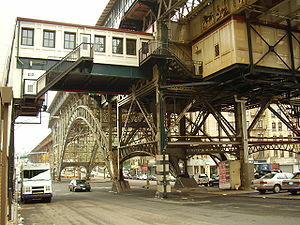 Strand takes another famous photograph from this viaduct that emphasizes the modernist structure of the train platform. Of particular importance to the “House and Billboard” photograph, the viaduct afforded Strand something he was also seeking: invisibility. He was setting one of what Maria Hombourg calls his “waiting traps.” Strand was at a period in his photographic development where he wanted to photograph people unaware of his presence. The viaduct provided ample urban camouflage, so he could set up his camera and wait undetected for the unsuspecting subjects of his gaze to stage themselves naturally in front of his lens. Another of the initial puzzling aspects of the photo is what time of day is it when Strand snaps his picture? Is it early morning? Is it late afternoon? Is it slowly creeping towards night time? In fact, it is likely that the photograph was taken near noontime on a very, very bright day. So what accounts for the relative “darkness” of the photograph? As Maria Hombourg notes in her book Paul Strand circa 1916, photography around the Photo-secessionists (a movement started by Alfred Steiglitz) emphasized the active intervention and manipulation of a photograph and soft focus lens to give photography a misty, dreamy quality in the early 20th century, a kind of impressionistic photographic palette. By 1916, Strand was experimenting with much sharper images and bold geometric shapes (esp. in his photographic still life work). And contra the Seccesionists, he didn’t want to manipulate the image, he wanted to capture reality in a much more objective fashion. What I really like about Strand’s choice here is that he is using a technique more common in landscape photography at the time rather than urban photography. He is shooting at F/22. F/22 does another interesting thing: all of the even-toned areas of the photo turn to black when this setting is used. Thus, even though the photo is black and white, even-toned parts (such as the clothing on the people) are rendered more starkly as black. But F/22 is a great choice for this photograph. It brings the urban landscape into an observable whole. Your eye can wander across the picture and see details that you might not even notice if you were standing on the 125th St. Viaduct. And importantly, it adds a degree of mystery to the people standing on the left side of the frame. 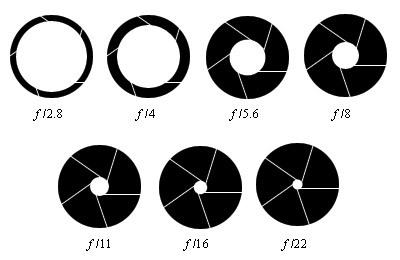 The scene in “House and Billboard” might seem to have little connection to the photographic experiments of Eadweard Muybridge. But as in Muybridge’s famous experiment to capture a horse will all four hooves off the ground, this photograph is literally “freezing time.” What is the point of “freezing time?” For Strand at this moment, I would argue it is about revealing what is hidden from casual views. Strand is pushing objective realism to its limits (both aesthetically and technically). 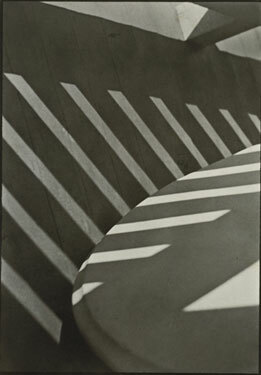 The depth of field of F/22 and the “waiting trap” on the viaduct merge into an exquisite cross between the macro and the micro: the complex interrelationships of the urban environment and the stunning play of light and shadow that he explored so memorably in the close-up style of his still life photographs. This photograph was first displayed publicly at Alfred Stieglitz’s 291 art gallery. That is significant since 291 also displayed the photographic works of Edward Steichen, Gertrude Kasebier, and Stieglitz himself. 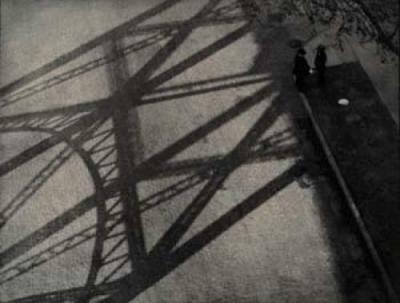 Stieglitz also published the photograph in his influential journal, Camera Work. There is no doubt that Stieglitz understood the significance of this photograph (and other photos from around 1916 by Strand). This photograph is part of the body of work that started to gain recognition for photography as a major art form. 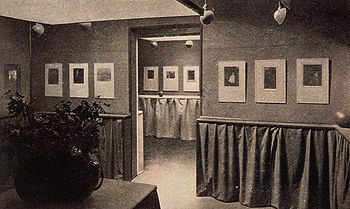 And the 291 gallery was an important site where a young Strand saw avant-garde painting from Europe, and important works by Matisse, Rodin, Cezanne, Picasso and Duchamps. In fact, while some scholars might want to read cubist elements into “House and Billboard,” from my perspective, the lesson that Strand took from Cubism was compositional complexity and the visually dynamic relationships that can be built from geometric patterns in different visual planes, compositional strategies that are on full view in this photograph. Moreover, through his contacts at 291, Strand would begin to see the connections between modern art and progressivism. They both involved new ways of seeing the world, of proposing new possibilities for culture. Strand is well known for his political activism, and the early seeds of his progressive vision and his urban sensibilities are on display in “House and Billboard.” It seems an early working out of ideas that he would express more fully in his 1920 film Manhatta. Part of what I find so captivating about this photograph are the people in the frame. This is a pro-filmic event. Strand is not staging this action, he is waiting patiently for it to happen. He is waiting for that perfect moment to take his picture. I think this would be a much different picture without the human element. The people help animate, give life to this mise-en-scene. It is not just a beautiful architectural still life, it is a portion of the metropolis teeming with life. I think what makes it so memorable is that it is capturing a moment of transience. What those people are discussing or meeting about is not important. It is one of millions of meetings that occurred that day in New York City. But for Strand, they are choosing to stand there at that moment, they are not posing. They are carrying on the business of living in the city. The moment is fleeting, ephemeral. And yet, almost a hundred years later, we stare at it and try to comprehend its meaning. I think it lends the photograph an almost lyrical element. Things do become interesting once the human element comes in, and you can imagine Strand, high up on the viaduct in his “waiting trap” just preparing for this very moment, life caught unawares in all its transcience. I would be remiss if I didn’t acknowledge the strong sense of composition and design in this photograph. It is very carefully arranged. Look at the edges of the frame. He clearly has a light pole framed on the left, the skylights in the top right hand corner, the letters in the billboard. It is hard to imagine how this picture would work a foot to the left or the right, a shift in the foreground objects, etc. But it also has a strong alternation of rectangles and right angles that play with a burgeoning sense of the solidity of the 20th century city. It has a great play of light and shadow to bring an element of impermanence into the tableau. It’s a formalism that finds itself in earlier experiments with still life photography. It’s an expression of the lived reality of the modern city. And rather than capturing the hurly burly flux of Wall St. Bankers against an imposing façade, here Strand the artist shows a much more human scale, which elicits a very different emotional response to me. This seems to be more about the day-to-day realities of the working class in the modern metropolis. 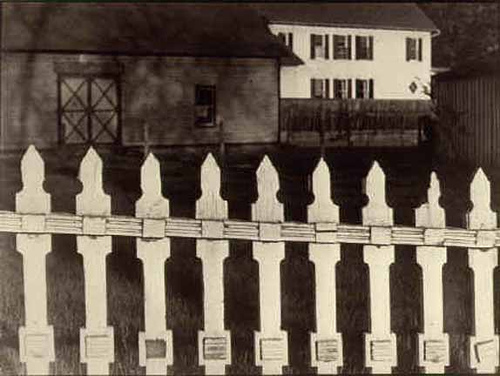 As in his wonderful photograph, “White Fence,” the lines in this photograph play with issues of recti-linearity. In fact, the main line that bifurcates the frame is not entirely straight, it is a slightly askew line. The line’s wiggly nature energizes the frame, like a bolt of energy running down the middle of the frame. The left edge of the frame is a road. This is a picture that actively encourages the viewer to wander, to travel into the frame. But it is an inexhaustible world: one gets the idea that there are many more places to go. This is a nexus, a junction in the city. There is also a very witty visual pun that plays with the issues of light and shadow in the photograph. The house in the middle ground has three windows and it appears that two of the three windows have “the lights on.” It creates a wonderful moment of asymmetry, reminiscient of “White Fence.” But it turns out that those are not lights, but rather white curtains/shades, and that only two of the three rooms have that window dressing. Strand dedicates significant space in this photograph to rooftops. Rooftops are not necessarily the most interesting architectural piece of a building, and they are invisible to most viewers, especially at street level. They have little of the visual grandeur of a façade. But it seems that Strand is on to something with showing rooftops. I think a film like Charlie Chaplin’s The Kid, which came out four years after this photograph, shows the potential of rooftops for the urban psychogeography. They are spaces that can be activated both in reality and in the imagination. It is a space in the asphalt jungle that seems to connect to nature (especially the sky). It is a space of adventure, a place of danger, a mode of escape, a method of transit. I think that the way the photograph is framed (road on the one side, a set of rooftops on the other) suggests two modes of traveling. And when I think of Charlie Chaplin escaping from the police by running across the city’s rooftops, something akin to a similar impulse is present in Strand’s photograph. 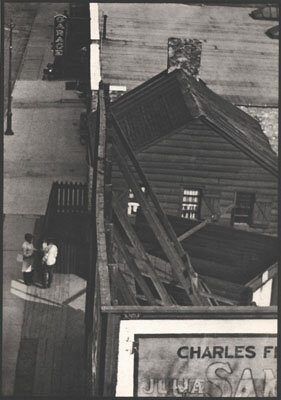 This photograph activates rooftops as a space of imaginative play. I wonder if someone just stumbles across “House and Billboard” today if the photo would excite the spectator the way this photo excited Strand’s mentor Alfred Steiglitz in 1916. I would say probably no. But for good reason. The type of visuality that Strand is creating here has become commonplace. His type of urban surveillance (his “waiting trap”) is literally how we are mapping urban space in the digital age. Strand’s surreptitious camera work finds its digital parallel in Google’s Street View technique that is quietly going around the world and photographing urban street views (like “House and Billboard”). And like Strand’s photography, Street View becomes really interesting when “the human element enters in.” There are websites dedicated to showing people who have appeared in Street View. 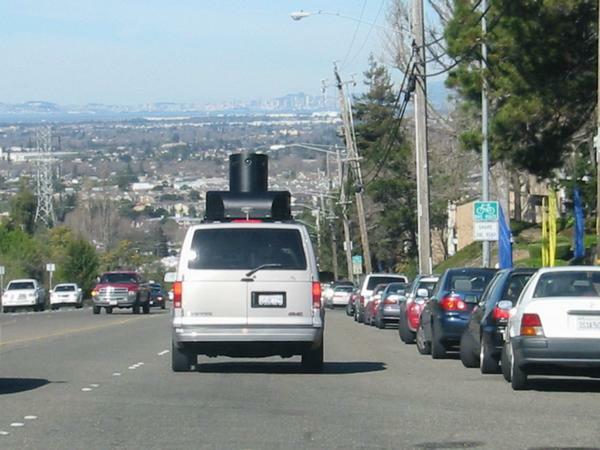 These are people caught unawares by Google’s camera people in their high-tech vans. Hombourg, Maria Morris. Paul Strand circa 1916. The Metropolitan Museum of Art, New York. Distributed by Harry N. Abrams. [Exhibition Catalog], 1998.